The villa was built in 2009. Situated in an idyllic location in Kambia, municipality of Vamos, Chania, Crete, it is ideal for holidays that combine both mountain and sea. Villa Amalia is surrounded by olive trees and offers spectacular views of Souda Bay and Akrotiri peninsula. Villa Melitini is located in Chania in the area of Vlite of Souda. It is a three-level maisonette built in an area of 4.000 sq.m with an ecological pool with salt of 78 m2, garden-lawn, garage, barbecue, wood oven, garden with vegetables, herbs, vineyard (all biological) stone fencing and absolute privacy. It is just 200 meters from Vlites Beach. This vacation home villa rental is just a few meters from the ocean. it has stunning views to the sea and the sunset. there is a private terrace area and gardens surrounding the pool to one side of the property. Bluebell Villa enjoys panoramic sea views and is developed less than 100m from the seafront. Famous Tersana and Stavros sandy beaches are less than 1500 meters from the property. Chania Vacations' aim is to offer the best luxury villas in Crete for rent. If you're interested in Crete vacation rentals you are to the right place. Click here to check our selection of luxury villas in Crete for rent! Join Chania Vacation and get listed for free. If you own a luxury villa in Crete for rent then you're just steps away from becoming a part of our company. 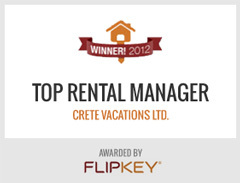 Click here to list your Crete vacation rental now!